Lexmoto loves its dealers! Being the first of the Chinese brand to move to dealer only sales meant that we could add a third party PDI process which meant that our products were being checked with even more efficiency. It's a step that quickly established the Lexmoto products on the premium side of the Chinese motorcycle market and our success and reputation has grown ever since. 10 years ago they would have laughed at the suggestion of a Chinese brand being competitive against its European and Japanese rivals. 5 years ago they could feel that times were changing and many forecasted a change of dominance in the industry. After becoming the first Chinese brand to be awarded Scooter Franchise of the Year in 2014 ahead of all European and Japanese rivals, Lexmoto has demonstrated its ability once again. 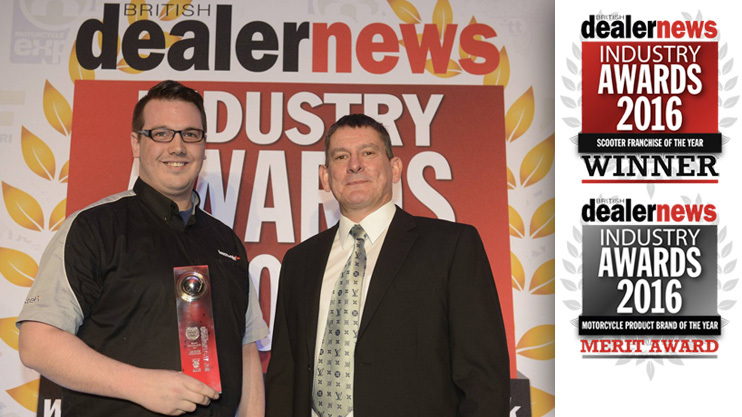 Lexmoto reclaimed the Scooter franchise of the year award but also picked up a merit in the Motorcycle franchise of the year award category (Effectively second place). In this yearâs voting the responses were collected from 3500 dealers across the UK. Lexmoto were beaten to the top Motorcycle franchise of the year prize by Yamaha. The deficit was 5 votes in favour of Yamaha. Despite not quite getting the top prizes in both categories the significance is the same. Chinese Motorcycles and Scooters are on the heels of the Japanese and European brands and should certainly not be underestimated. Lexmoto wants to be the best company possible. For its staff, for its dealers and all importantly its customers. Llexeter and the Lexmoto Team would like to thank the dealers for their support and look forward to trying to defend their position as the premiere Scooter franchise in 2017 and hopefully take the crown in the Motorcycle franchise category also.